Down is metal supergroup. Most notably we have Phil Anselmo of Pantera fame on vocals and Pepper Keenan of Corrosion of Conformity (COC) on guitar. Down could called a heavier version of COC, which in turn could be considered a heavier Lynyrd Skynyrd or Molly Hatchet. That's my opinion at least. 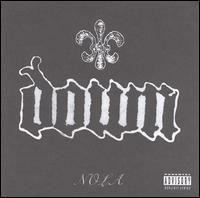 It's pretty simple with Down, heavy guitars, great riffs, Anselmo's trademark vocals/lyrics, and a haze of smoke. This is a great track from NOLA. It talks about coming to a realization about one's battle with substance abuse. The cowbell is really cool in this song. During the bridge at 2:17 there's two beats of cowbell that start in the right channel that repeat and fade out. Then there's two more in the left channel that repeat and fade out. And that repeats three more times. It's a really cool effect, especially with headphones on.